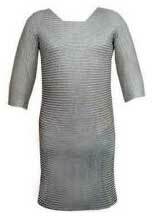 We are looked upon as one of the most dependable Chainmail Suit exporters from India. The unmatched quality and inexplicable kiting of the Chainmail Armour Suit has attracted various national as well as international clients to place bulk orders. Moreover, the Medieval Chainmail Suit is also available in the varied dimensions as per the specifications provided by the clients.